Celia’s international influence has primarily been related to two major issues in contemporary sport; gender equality and child protection in sport. Celia’s international influence has primarily been related to two major issues in contemporary sport; gender equality and child protection in sport. Celia is a founding member of WomenSport International, and a believer in international networking for the benefit of women in sport. In her international advisory roles on child protection in sport, Celia assisted in the development of safeguarding policies for both UNICEF and the International Olympic Committee. “There needs to be a concerted effort to articulate the transformative values of sport. We (the women and sport movement) must be prepared to stand up and be counted on the issues (facing sport as a whole), to expose the causes of crisis and to put in place alternative systems and approaches which will, ultimately, make sport a more humane activity for both men and women. We have heard examples this week (at the Brighton Conference) of some of the more shocking aspects of sport for women: pressure on young gymnasts and dancers to submit to extreme diets and training regimes which cause premature bone loss and skeletal decline, expectations from male coaches of sexual favours from their female athletes in return for team selection, ostracism and humiliation of lesbians… these practices must be stopped and positive changes brought about which will enhance the dignity of women and men and emphasise all the good things we know sport has to offer us. It is time for women’s sport to think global and act global. ...The collective wisdom and strength of a network equals more than the sum of the parts which is why networking is so important to women in sport… The principles of networking apply internationally as they do locally but on an international scale there are perhaps some added dimensions. One of these is the dimension of cultural sensitivity, a need for us to recognise, respect and learn from the different traditions and contributions of those from other countries: a sense of reciprocity is needed if we are to network effectively across national boundaries. It is all too easy for those from white, wealthy, academic traditions to assume that they know best, to act as if they had a monopoly on sport science knowledge, on policy and best practice in sport for women. An extended and adapted version of an address given to the International Women and Sport Conference, 'Women, Sport and the Challenge of Change' in Brighton, UK in May 1994. The paper firstly explores reasons as to why, at the time of address, women's sport had failed to achieve the impact of the broader feminist movement. This is with particular reference to the emergence of an international community of women's sport. Secondly, the paper examines the proposition that women in sport might learn some lessons from the political processes adopted by the environmental movement. Celia was lead author on this report in 2007 which draws together a set of materials on violence in sport. The review, which focuses on industrialised countries, provides examples of both good and poor practice, and makes suggestions for sport organizations to assist them in their violence prevention work. Celia was an advisor for the IOC, and co-authored this research paper published in the British Journal of Sports Medicine which is an updated and extended version of the 2007 IOC Consensus Statement. 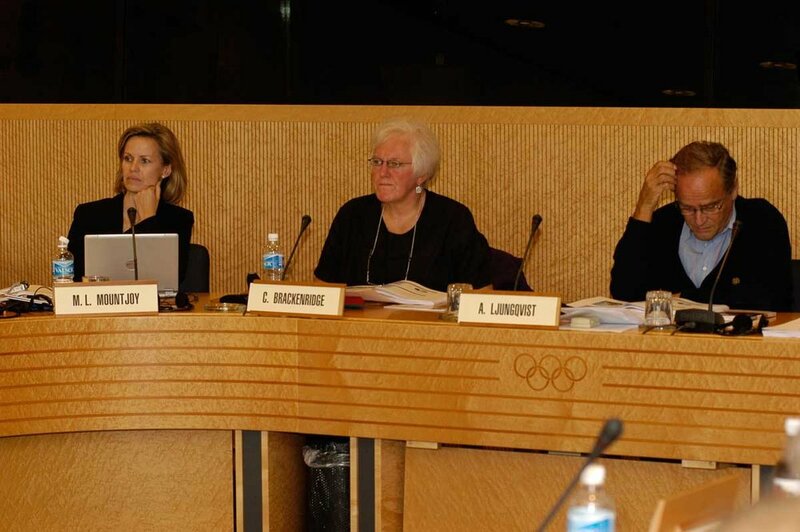 The original IOC Consensus Statement defines the problems, identifies the risk factors, and provides guidelines for prevention and resolution of sexual harassment and abuse in sport. A set of videos aimed at athletes, coaches, and associations and federations which outlines individual cases of sexual harassment and abuse in sport, and gives advice on what action can be taken to prevent the sexual harassment and abuse of athletes in sport. I was instantly full of admiration for Celia’s work on protection and violence and exploitation in sport. And she came to me not solo but with some incredible peers.